Mia Tomikawa, speaking for Master Ryuho Okawa of Happy Science, talks to Alexander “The Engineer” Lim, host of AuthorStory by alvinwriter.com about her book, Invitation to Happiness: 7 Inspirations from Your Inner Angel. Happy Science is a global organization established in 1986 by Ryuho Okawa, and is a spiritual movement dedicated to bringing happiness to people all throughout the world. Mia herself became involved with Happy Science when she lived in the United States, and in addition to being a member, she also presently works with the publishing division of Happy Science, translating Master Okawa’s works from Japanese to English. Mia noted that there are a lot of people who are unhappy today who want to be happy, but have no idea how to achieve that state. The book, Invitation to Happiness: 7 Inspirations from Your Inner Angel, is a practical guidebook intended to provide a starting point to achieving happiness, and to act as a gateway to spreading happiness throughout the world. The book is intended to be read in hard copy form, and to this end, the design was made the way it was, and while it is targeted primarily to women, men can likewise appreciate the design and pick up things within that will help them. Although the book is intended to be read in progression, from the first chapter to the last, Mia remarks that a reader can go straight to the chapter where he or she is presently having an issue with and then work from there, and explains that the downloadable meditative music, found on the website, is intended to help the reader in doing the various exercises found within the book. Mia explains that the “Inner Angel” mentioned in the book is a spiritual being that supports and guides people, with the Christian equivalent being “guardian angel.” Mia notes that hardships and failures, which are things that the ordinary person wants to avoid out of a desire for convenience and ease (and because these aren’t experienced in the spiritual world) are actually necessary for people’s growth, giving, as an analogy, the aches and pains one would experience if one works out at the gym, for the pains experienced during a gym workout enable one to build his or her muscles. Mia notes that grudges and resentment spring from our not being able to understand why other people do the things they do, and that compassion and tolerance spring from seeing things from the other person’s point of view. Invitation to Happiness includes an exercise that would help out with this issue. Mia remarks that, before we are born, we create our own goals (as spirits), and that remembering what these goals are, and then working towards these, bring joy to us and help us achieve a connection with our ideal self, our so-called True Self. The True Self is the part of a human being which is brilliant like a diamond, with the equivalent Christian concept being one’s Divine Nature, while the False Self is the part of a human being that opposes the True Self, and it is this False Self that harbors negative emotions such as jealousy and grudges. Mia remarks that, for people who don’t even know where to start to discover their True Self, they should begin by believing that one’s True Self exists, and from there, finding out what one’s strengths are and then build on these. Mia hopes the book will enable its readers to discover their True Self, why they are living on the Earth, and what their strengths are and then sharing the joy they discover. To the curious, Mia says she would explain that the book is a guidebook and a tool whose contents its readers need to practice in order to develop themselves spiritually, and Mia invites everyone to just try the book out for them to see what it really is to be happy. 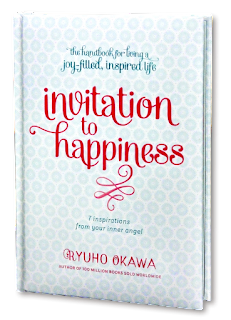 The website for her book, Invitation to Happiness: 7 Inspirations from Your Inner Angel, is okawabooks.com. Purchase on Amazon: Invitation to Happiness: 7 Inspirations from Your Inner Angel.